I am pleased to let you know, though belated, that our recently concluded 13th Annual Golfing Tournament was a resounding success. The tournament took place on Saturday, July 12th at the Hornby Glen Golf Course, under clear blue skies and with the sun shining down on all participants (unlike the previous year when we got rained out on several occasions). 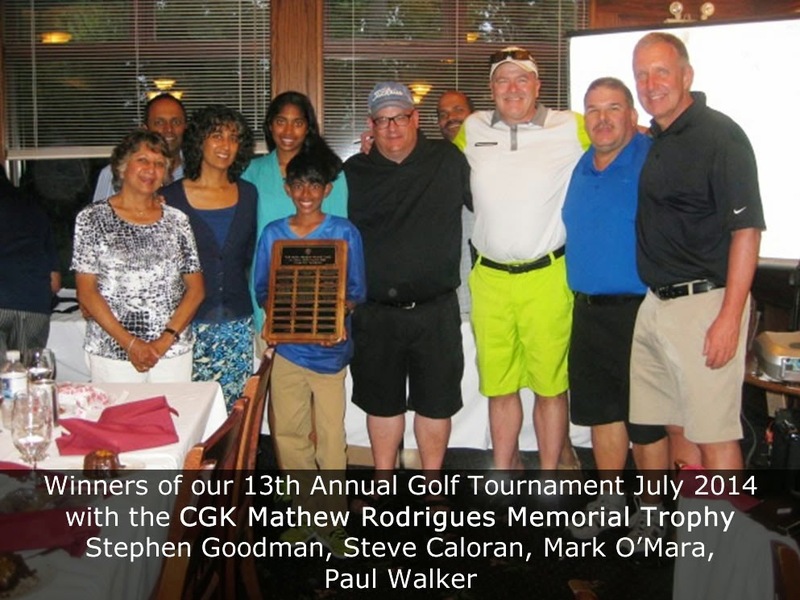 The renamed winning plaque CGK Mathew Rodrigues Memorial Trophy was won by Bro. Stephen Goodman (from our council) and his team of Steve Caloran, Mark O’Mara & Paul Walker. Well done Stephen and Team! We also welcomed Maureen Rodrigues (spouse of CGK Mathew Rodrigues), daughter Michele, son-in-law Cedric and grandkids Adelaide & Noah, who joined all of us for supper and the distribution of the prizes and the winning raffle tickets. 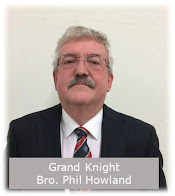 On behalf of the executive committee, our grateful thanks to PGK Valens, Chair (second year running) and to his hard working committee of brother knights. They worked hard on obtaining hole sponsorships, raffle prizes, silent auction items and other items to make the event a highly successful one, both in terms of enjoyment coupled with fraternity, amongst the brother knights and closing the event with a bottom line of over $4,000.00. Well done Team and keep up the good work. Our grateful thanks to all of our sponsors who contributed both in cash and kind, to the brothers knights from our council for their generous donation of gifts including silent auction items. To all of the participants from our council and the other councils, SABA Assembly & other Assemblies and all other participants, our sincere and grateful thanks. Out thanks also go to the volunteers (knights and others) who assisted prior to and on the day of the tournament. Our hole & card sponsors were: REMAX Realty (Bro. Reynold Sequeira), Fraternal Advisor-Bro. Alan Pires, Bro. Nicholas D’Souza, Bro. Felipe-Rey & Family, Bro. 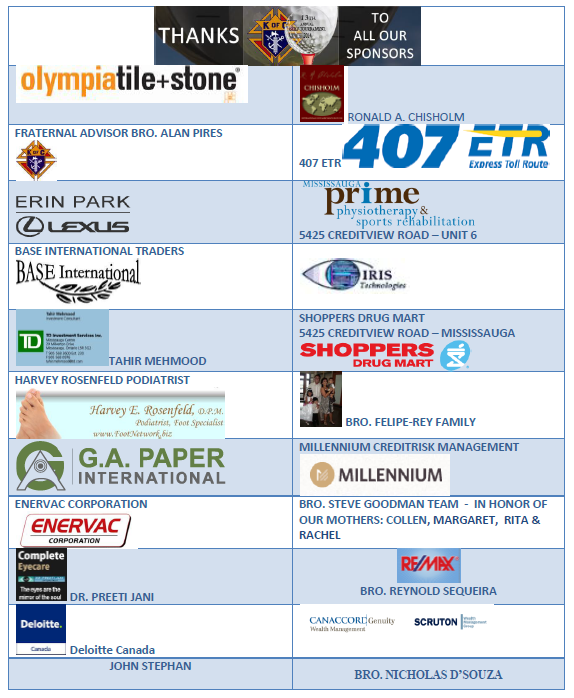 Steve Goodman Team, John Stephan, Olympia Tile & Stone, Ronald A. Chisholm Ltd., 407 ETR, Erin Park-Lexus, Base International Traders, Tahir Mehmood-TD Canada Trust, Harvey Rosenfeld Podiatrist, G.A. Paper International, Enervac Corporation, Dr. Preeti Jani, Deloitte Canada, Iris Technologies, Shoppers Drug Mart-(5425 Creditview Rd., Mississauga), Millennium Credrisk Management, Prime Physiotherapy & Sports Rehabilitation & Canaccord Genuity-Scruton Wealth Management. 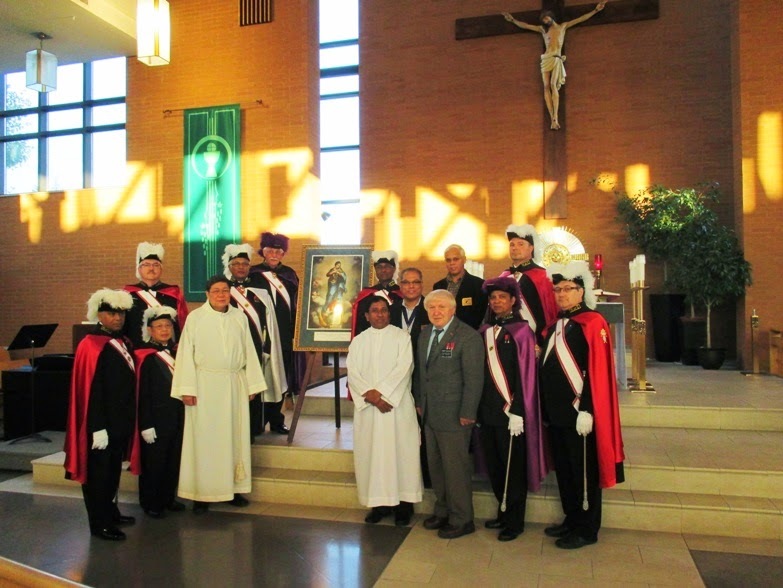 On Wednesday, July 16 which was the first day of the Icon of the Immaculate Conception Prayer Program, we were honoured by the presence of the Fourth Degree Knights, our Associate Pastor Fr. Susairaj, who prayed the novena mass, District Deputy Joseph Zielinski & District Warden Vivian Pereira. The rosary was conducted by the St. Francis Xavier Catholic Women’s League. On behalf of the Executive Committee, our grateful thanks to our Associate Pastor Fr. Susaiuraj, Fourth Degree Knights (who were largely from our council), the various prayer groups taking part in the program, and last but not least. the brother knights, their families and parishioners for their support and participation. Thank you to Bro. Mike Hessing and his supportive team of brother knights for making all the arrangements for the Icon program. 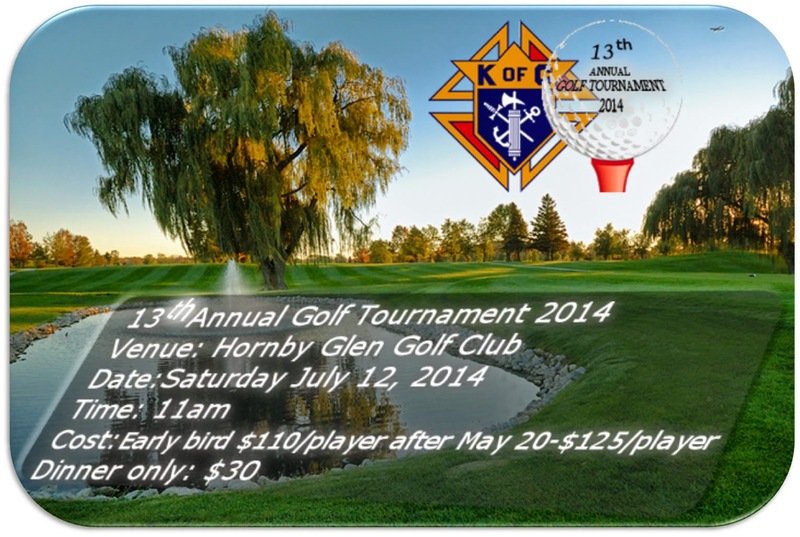 Our 13th Annual Golf Tournament is all set for tomorrow Saturday, July 12th at Hornby Glen Golf Course. Registration begins at 10:30 am and will close by 11:30 am so we can get started on time. Our "Free Putting" contest will start at 10:30 am where you have a chance to win $50, $20, $10, $5 by landing on these bills. You will get two free putts/balls for this contest. Additional putts are available for $2 for two balls. The entrance fee you paid for this tournament was at cost, so all the revenue we raise for the charities we support (including Dr. Simone's - Feed the Children) come from our ad sponsorship, raffles and silent auction. We have a lot of raffle prizes to give away so please purchase your raffles ($10 for 5 tickets or an arms length for $20) from Brothers Steve Goodman, Tibush Quadros and Edwina D'Cruz. If you will not be staying for dinner, you can still partake in both the raffle and silent auction (Samsung Tablet 10.1 & Blue Jays Tickets) by providing your name and phone number on your raffle tickets, or silent auction sheets. On behalf of council 12067 and our 2014 committee, I would like to thank-you for supporting our annual golf tournament. 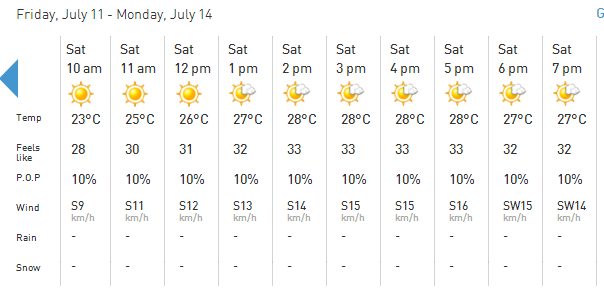 Looking forward to a fantastic day on the golf course! !